Dry eyes occur when the eyes either don’t make enough tears, or the quality of the tears produced is reduced, which means the tears can evaporate rapidly from the surface of the eye, allowing the eye to dry. Often, the reduced tear quality is a result of blockage or inflammation of the oil glands within the lid margin. When the surface of the eyes dry out, the eyes become inflamed. They appear red, and the whites of the eyes can appear to be pink and swollen. Normally, the eyes become very irritable. 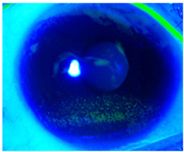 When seen on the microscope, using a fluorescent dye called fluorescein and a special cobalt blue light, the denuded surface areas can be seen as green specks on the surface of the eye. If the main problem is a lack of tear production, then the term 'keratoconjunctivitis sicca' or ‘aqueous deficiency’ is used. However, if the main problem is poor quality of tears (but plenty of them) as a result of inflammation or blockage of the oil secreting glands in the lid margin, then the condition is called ‘obstructive meibomian gland disease’, more commonly referred to as blepharitis. Special receptors on the surface of the eye are then stimulated by this inflammation, which causes a ‘reflex tear production’. This leads to the main tear glands to literally ‘switch the tap on’ in an attempt to wet the dry surface. The result is often the production of excessive watery tears ( as opposed to oily tears) which results in watering of the eyes. When concentrating (eg using a computer or driving), we can blink up to 5 times less often, leading to increased tear evaporation. Remembering to blink more often can help keep the eye surface wet.